To poach chicken, cover the chicken with water in a small pot. Bring to boil and then reduce to a low simmer to cook for 45 minutes, covered. Cool completely in poaching liquid then transfer to a plate to shred finely with 2 forks (the remaining poaching liquid can be frozen to use as stock). To make dressing, combine fish sauce, lime juice, sugar and garlic in a small recycled glass jar and shake vigorously until sugar is dissolved. 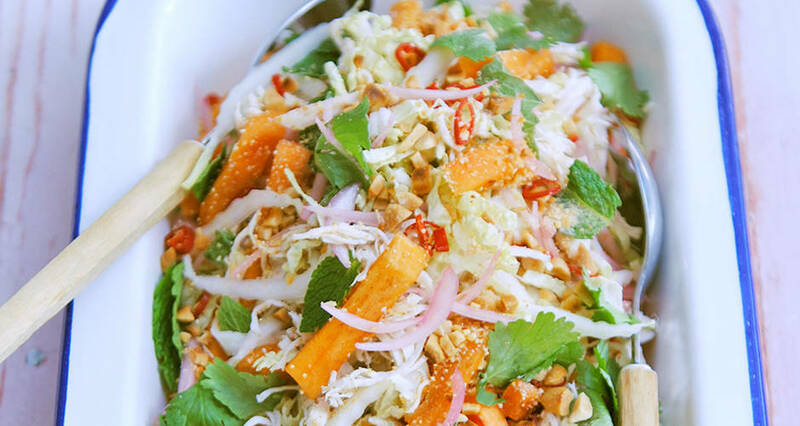 To assemble, combine persimmons, cucumber, cabbage, spring onions, mint, coriander and chilli (if using), chicken and dressing in a medium to large bowl and toss very gently with hands or chopsticks so as not to bruise ingredients. Divide into 4 portions and garnish with roasted rice, fried shallots and peanuts and serve immediately. Note: You may make your own roasted ground rice by purchasing glutinous rice from an Asian grocer and dry toasting 1/2 to 1 cup in a wok or frypan on low heat until a pale golden colour. You must exercise some patience while doing this as a high heat will burn the rice but not toast it all the way through. Do not use any other types of rice as they will be unpalatable and a jaw breaker even after toasting, while glutinous rice will shatter nicely between your teeth. Roasted rice is often added to Thai salads for its beautiful nutty flavour and textural crunch but also for helping very runny dressings adhere to salad ingredients. After toasting, cool, then pound in a mortar and pestle or grind in a spice grinder to a sandy consistency. Store in an airtight glass container for up to 2 months.